With over 1600 hectares of SPRING ONION, FRESH GARLIC, FRESH ONIONS, HOT PEPPER, POMEGRANATE AND GRAPES grown so far and with every crop STARS Egypt is your supplier specialized in the cultivation, selection and packing. 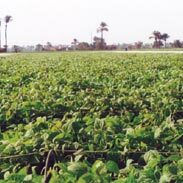 At STARS Egypt, we know that supplying top quality produce is more than just growing it, which is why we follow exact sorting practices as well as strict post-harvest protocols. Thanks to a good planning of the production, anywhere in the world, we are able to deliver products. The product we export meet our customers' exact specifications on time, in the best possible condition, and what customers expect from fresh produce suppliers ; which is even the more impressive considering that STARS Egypt supplies many of the most demanding EU supermarket suppliers. Our principal Export channels can be found in England, Ireland, Germany, France, Italy, Netherlands, Belgium, Switzerland, Sweden, Poland, Ukraine, Croatia, Serbia, Montenegro and Russia. We deliver our products in various types of packaging form consumers, wholesalers and supermarkets In brief, if you are looking for high-quality products at competitive prices, STARS Egypt is the right one for you.